Based on: Pursuing organic growth dynamics in a linear setting; also, searching the world for your pops and four magical macguffins. Ease of play has never been a goal for Kawazu, as anyone who has played any of the SaGa games can attest. Rather, his goal is usually to emphasize the freedom he grants the player in creating and developing their characters through the various systems that have been spliced into the games, and his works rarely waste any effort doing anything so mundane as explaining how their systems work in anything but the most general details. Kawazu's RPGs tend to be sprawling epics of technical game design, and as such concepts as �accessibility� and �balance� rarely factor in. Fortunately for the Legend series, the limitations of Nintendo's wheezy green-screen beast kept Kawazu from going full throttle. The first two SaGa games are a much more refined form of Final Fantasy II sporting a few new twists that would eventually become SaGa staples, and the player character archetypes and their individualized development systems provide an incredible number of ways to play through the game. Therein lies the problem. Kawazu�s work tends to emphasize giving the player great freedom in choosing how to develop the player�s characters while stuffing them into a linear play experience, yet despite the games' restrictive progression they tend to be terribly unbalanced. Western RPGs usually offer this sort of free-form character development as a matter of course, but they also offer ways of experiencing the game that suit these differing approaches to character-building. Kawazu�s approach is a little different, since the challenge arises less from the player's decisions than from the conflicts between the character development systems and the worlds they exist in. The SaGa games generally fail at explaining clearly just how any of their complicated designs actually work, resulting in a great deal of frustrating trial-and-error for anyone stubborn enough to stick with it. Compare Kawazu's approach to that of Will Wright, whose brilliance isn't so much his ability to create wildly open life sims but rather on his ability to subtly provide structure and hints on how the various bits and pieces of these sims should work together to form a coherent whole. Maxis also publishes some truly excellent manuals as well, which helps to clarify their complexities in a way that Square's flimsy manuals don't. Legend II lacks most of the things that make Maxis games so popular. Because of the game�s limited scale, its intricacy only becomes readily apparent in the case of boss battles and in the monster �leveling� system that revolves around eating the meat of fallen enemies to gain their powers. Using a monster-class character in a Legend game without the aid of a FAQ is practically a crapshoot; you'll find few in-game hints about what meat will do what to your monster. Legend II is by far more the complex of the first two SaGas, and it is nearly impossible to know exactly what will happen to a monster without a guide or extensive experimentation. This is a common problem in Kawazu�s catalog, mitigated here only by the fact that players don�t technically have to use monsters. It would be like if someone new to Pok�mon had been handed the game and told only that the various creatures had strengths and weaknesses, so good luck. Since much of Pok�mon relies on that rock-paper-scissors mechanic, not knowing any of the specifics would make the game nearly impossible to complete. For a series like Legend, where character development is dependent on these systems, it's a particularly glaring omission. 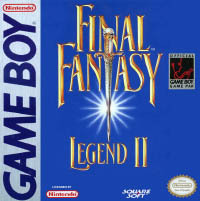 The mechanics do impart upon the series as a whole a sort of freeform quality to them, though Legend II�s vision of a sandbox is a narrow rectangle with the start of the game at one end and the conclusion at the other. The freedom only comes into play with the creation of the player party and the characters' development over the course of the adventure. Its narrowness comes from the limited nature of the game itself. For a Game Boy release, the character development systems in Legend II are really elegantly constructed, if opaque, with each of the four character archetypes having a different growth mechanic associated with them. Humans, being tool users, improve according to the weapons and items they equip; mutants grow randomly according to the whims of the random number generator and a few tricks on the player�s part; robot abilities change strictly according to the gear you equip them with; and monsters change form according to what kind of enemy monster meat they eat. To some degree, even this aspect isn�t completely player-controlled, being left in part to the whims of the random number generator for human and mutant characters, while the monster evolving system is rigidly defined yet completely opaque. Legend II's growth systems feel almost like bonsai trimming. Since a lot of the nuts and bolts of the growth system are out of the player�s hands in one way or another, it falls to the player to use what small control he does have in order to prune away the excess bits and point the party towards the form peeking out of the separate branches. It�s a restrictive take on Kawazu�s more open-ended development systems, but it still has an intriguingly organic quality to it that makes it fun to play repeatedly since no two parties are quite the same. Oddly enough, despite Kawazu�s inability to ever explain anything in any detail, those development systems are the main draw for the game because they fit portable sensibilities so well, much like Pok�mon. The linear nature of the game combined with the organic qualities of the character development system lend the game a technical feel that can be endlessly replayable for those interested, and the game is brief enough by RPG standards that creating a new party for another go at the game isn't a terribly involved process. It lacks the visual polish of Link�s Awakening? or the breadth of content that Pok�mon offers, but even Kawazu�s habitual hatred of accessibility can�t keep Legend II from achieving a certain dense likableness.